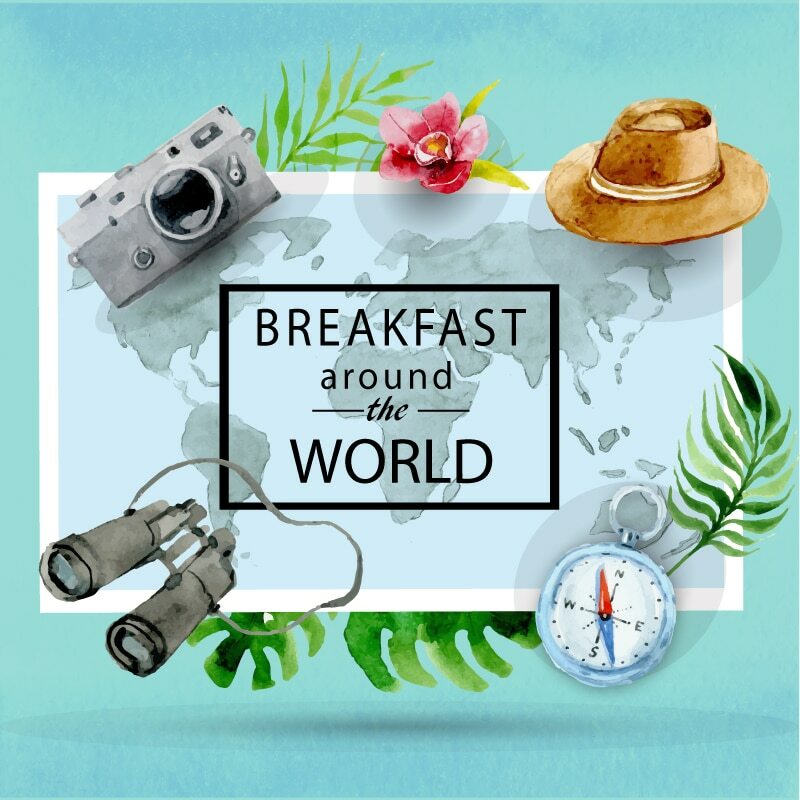 After the last week’s trip to the sunny and hot Brazil, in this #2 edition of the “Breakfast Around the World” posts series we are heading North to the land of the Vikings, meatballs and Ikea – Sweden! Let’s see how the Swedish breakfast looks like! Let’s start from clearing up the myths. Despite the crazy popularity of the Swedish meatballs (hello, Ikea!) and Swedish pancakes around the world, they are not eaten for breakfast. The same can be said about another Swedish staple – salmon. Neither salmon, nor other kinds of fish such as pickled herring are common for breakfast. 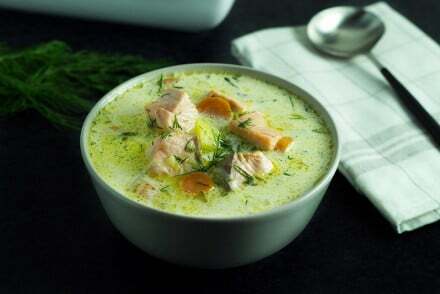 I found the fact that such a beloved food in Sweden as salmon is left behind a little bit surprising. In my humble opinion it is a perfect sandwich topping, and actually, even I have it for breakfast sometimes, but hey, it’s their choice! 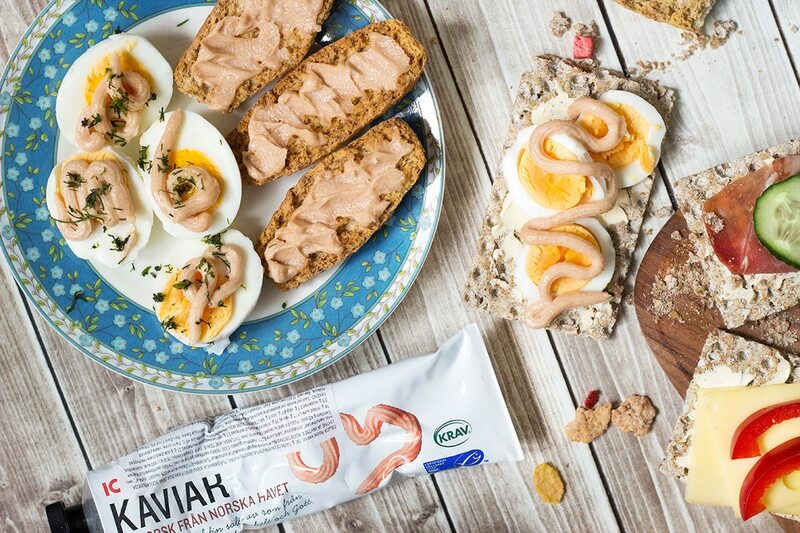 If you are a Swede and you are reading this post right now, please clarify the situation with the salmon and Swedish breakfast in the comments section below. Thanks in advance! So, now when we clarified what Swedes don’t eat in the morning, let’s talk about what is usually found on their breakfast table. It should be mentioned that Swedes eat their breakfast at home; going out for the first meal of the day is an unusual thing. Like in other European countries, open-faced sandwiches are a MUST. 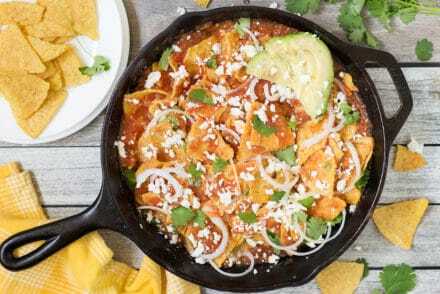 You can choose from different toppings that are put on top of either plain or crisp bread. One of the most authentic toppings is a fishy paste (cod roe spread also called “Kaviar”) from a tube! More about it below. Boiled eggs are also a frequent guest. Swedes also like such international breakfast staples as oatmeal porridge and cereal or muesli. 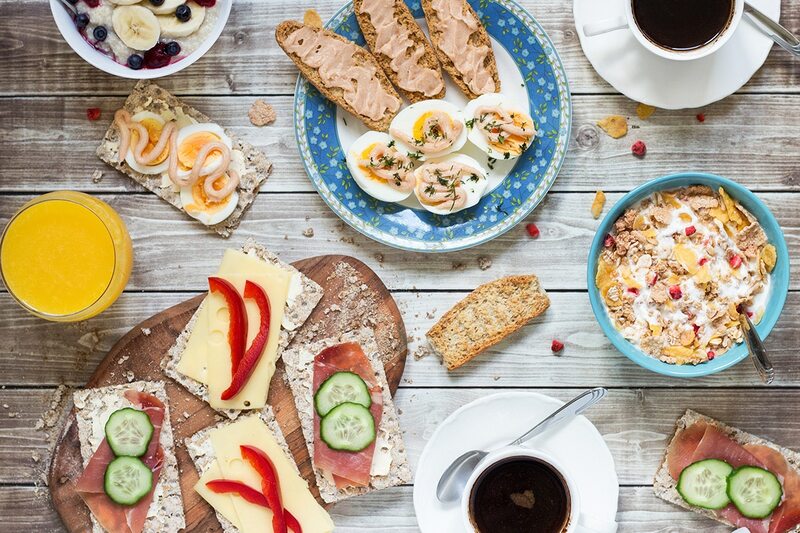 Now, let’s dive a little bit deeper into the details of the ordinary Swedish breakfast. Swedes can’t imagine their breakfast without a cup of coffee. Strong coffee. 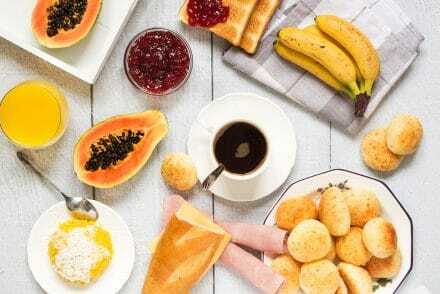 In the last post about the Brazilian breakfast I told you that Brazil is the world’s largest producer of coffee, right? Well, Swedes are not known for producing coffee, but they drink a hell of a lot of it! Sweden is in the top 5 of the most coffee drinking countries in the world! If you are not a fan of this black drink, like me, pour yourself a cup of juice. Breakfast sandwiches in Sweden are as plain as possible. 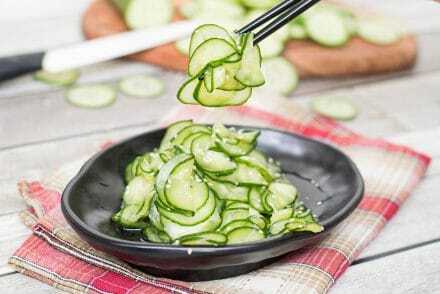 Bread, butter or margarine, cheeses, cold cuts, and a simple veggie on top – cucumber, bell pepper or tomato. Nothing fancy. Well, there actually is one interesting sandwich topping option. How about the roe spread (caviar) in the early morning? This fishy paste comes in tubes and Swedes are crazy about it. 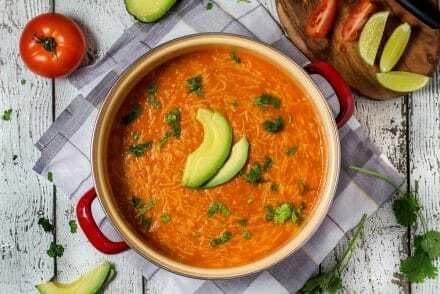 This Swedish specialty is not for the faint of heart and will most probably shock a foreigner’s palate. I was so happy that I was able to find it in my country! You can look for it in your local Ikea, there is a 99% chance they will have it! The roe spread didn’t make my palate feel bad at all, except the fact that you probably get a week worth of salt intake in one serving, ha ha! I guess I quite loved it because these types of products are common in Eastern European countries (not for the breakfast though). But anyway, you have to taste it at least once in a lifetime! Some time ago the most famous cod roe paste producer “Kalles” ran the advertising campaign, during which this fishy Swedish paste was served to people in the streets of Los Angeles, New York, Tokyo and other places. You can read about and watch their reactions in this New York Times article. Hilarious! 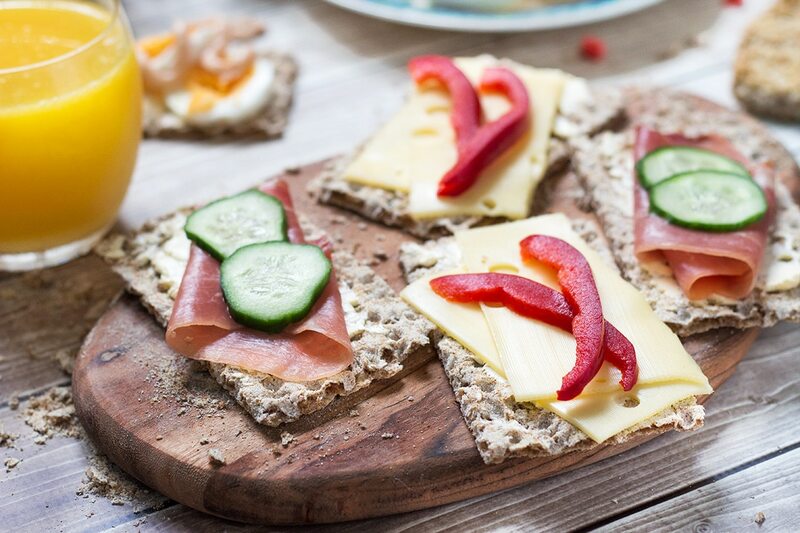 Swedish sandwiches can be made either with a plain or a crisp bread (knäckebröd). It’s a cracker like bread made from rye flour. It’s super light and can last for months. Crisp bread was for a long time considered a poor man’s food, however, lately it gained popularity in Nordic countries. I found it easily in my local supermarket, so you can try looking for it in your local shops or (once again) visit the mighty Ikea and you will find everything! I love the concept of Ikea. On one hand, it’s a furniture shop, while on the other hand, it gives you a chance to familiarize with the country’s culture. Pretty cool. This Swedish breakfast option is very familiar to me, because we have boiled eggs quite often in the morning in Eastern Europe. The only difference is the topping. We put some mayo on top, while Swedes squeeze some roe spread from a tube on eggs. Actually it’s even more common to put caviar on eggs, rather than simply on bread. I can prove the fact that Swedish fishy paste goes the best with boiled eggs. You can eat boiled eggs cut in half or sliced up on top of bread or crisp bread. Just don’t forget that caviar! Lastly, more simple and well known Swedish breakfast options. 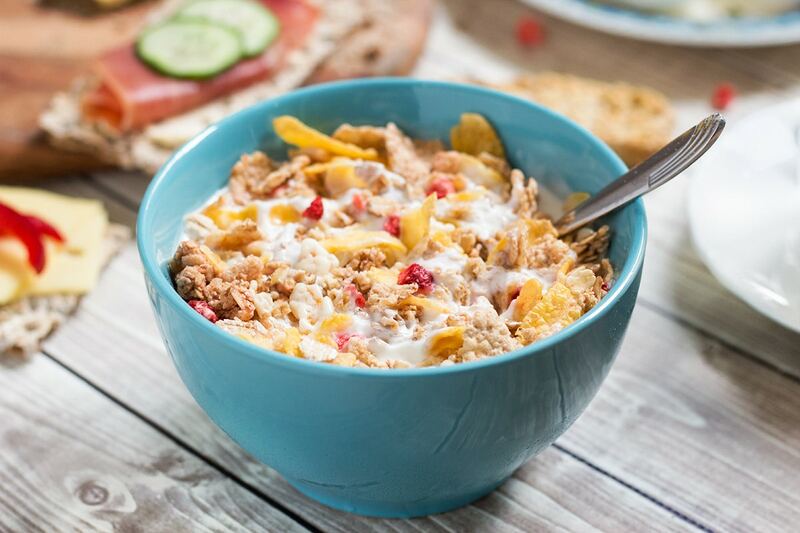 Swedes eat their cereal or muesli mixed with yogurt or a local specialty filmjölk (milk product similar to buttermilk or kefir). Filmjölk is very popular among Swedes, unfortunately I wasn’t able to find it and made my muesli with plain yogurt. 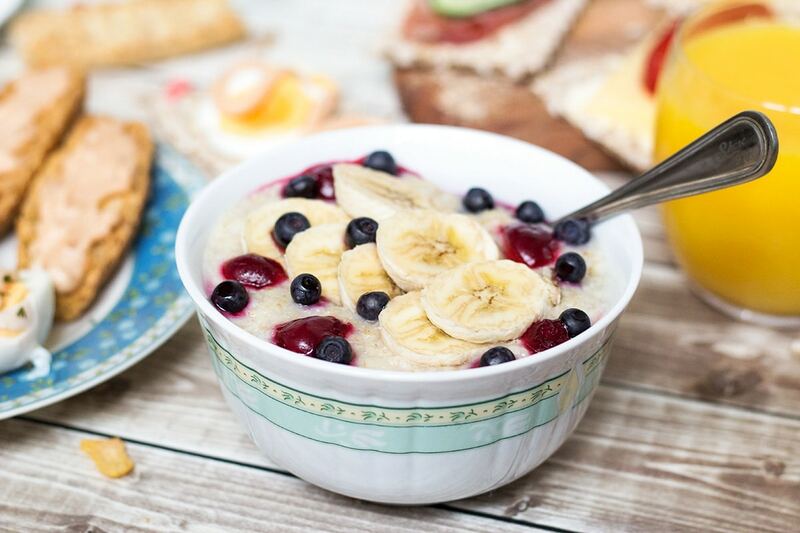 Talking about the porridge, it’s just the same as everywhere, made with oatmeal and topped with fruits and berries. That’s it! I really enjoyed this filling Swedish breakfast. Even their fishy paste! I have almost a full tube of it left, so I guess I have no other choice, ha! Have you noticed that there were no dessert at all? That’s right. Swedes don’t have any pastries for the breakfast. Just yogurt, muesli, some berries and fruits on top. Sometimes they do add some jam to a cereal bowl though. If there is the IKEA in your town, or a nearby town, you can easily replicate this Swedish breakfast. Maybe you even don’t need the IKEA and you will be able to find all the ingredients in your local or specialty shops. Believe me, it’s worth it. See you in other “Breakfast Around the World” posts! 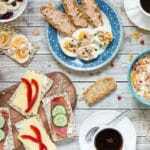 This Scandinavian breakfast offers open-faced sandwiches made with crisp bread, a selection of cold cuts and cheeses, eggs, muesli, and even a cod roe spread! Cod roe spread (caviar) the most known brand is "Kalle"
Serve all the items and enjoy your authentic Swedish breakfast! Hello!! I’m from Sweden but sadly, I don’t have an answer for the salmon question. smoked salmon is very common in “buffés” in Sweden, often in company of herring and cracker bread and potatoes, during christmas or easter or midsummer or whatever. for me, smoked salmon is more of a brunch-kinda-food. but, my tip for you; the cracker bread with caviar on the same plate as the eggs: try them with butter and strawberry jam. also, try white, soft bread toasted with cheese and orange marmalade. two very typical swede-breakfast-combos. Breakfast is my absolute favourite thing and I’ve eaten it in over 50 countries…but never Sweden. Looks good! 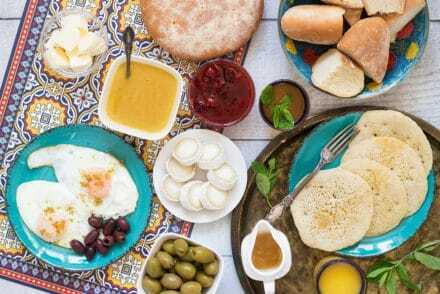 I have a post about Breakfasts around the world in our food section, Sri Lanka is our favourite. Lovely images! Love this! 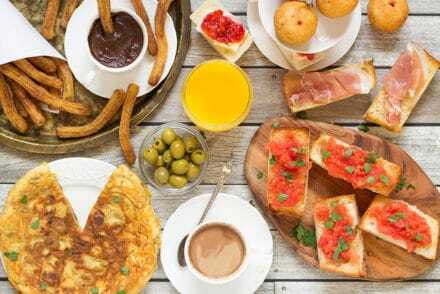 I’m not a big breakfast eater, but I sure am when we travel to Europe! I love to experience all the different breakfasts. 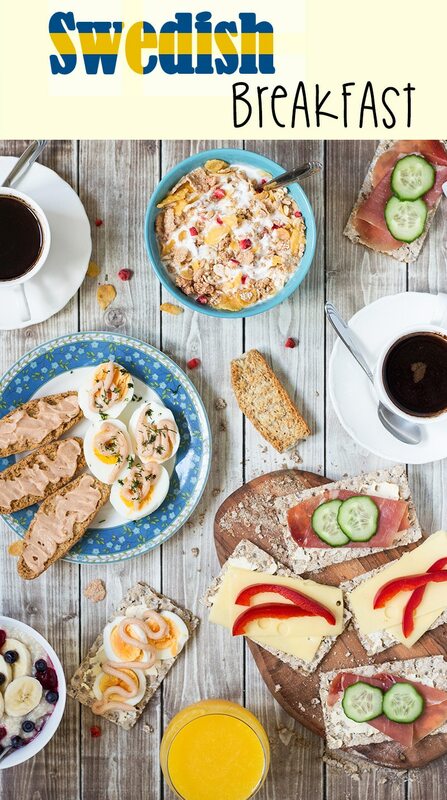 What types of cold cuts and cheeses are typical at a Swedish breakfast? Mary, just simple ham (skinda in Swedish) or some sausage (salami for example). Cheeses – simple cow milk cheese (prästost) or grevé (it’s like emmental). Hope it helps! Yes, smoked and boiled ham is probably the most common cold cut in Sweden, and “prickig korv” (literally “spotted sausage”) which is a bit like a salami or mettwurst. Prästost, herrgård, grevé and hushållsost, which are cow milk cheeses, that you slice thinly with an “osthyvel”, a cheese slicer is very common. One cold cut, that isn’t that common in countries like the US and the UK, but quite common in Sweden for breakfast is something called “hamburgerkött”, but it has nothing to do with hamburgers, it’s thin slices of smoked horse meat. It’s delicious with some pickles and horseradish, for instance. Another thing Swedes put on open faced sandwiches for breakfast is “leverpastej” which is a spreadable liver paté. There is another thing that we put on sandwiches, and that is “mjukost”, which is spreadable processed cheese, that comes in a tube. There are a big variety of those, some have pieces of shrimps in it (räkost), some have pieces of bacon in it (baconost), some have pieces of crayfish in it (kräftost), some have pieces of ham in it (skinkost), some have pieces of smoked deer in it (viltost) and so on (turkey, spicy taco, mushroom, reindeer, jalapeno). Wow, thanks for such a comprehensive comment, Åsa! You’ve got me intrigued with that smoked horse meat! I’m from Sweden. Personally, my family would never serve salmon other than during festivities because it’s too expensive, but picked herring and home-smoked fresh water fish isn’t uncommon. Since I’m from the northern parts, cold moose meat isn’t that unusual either. Though, the standard breakfast was oat porridge or, during weekend, rice porridge (sometimes translated to rice pudding which makes me wince) served with sugar and cinnamon. A common topping for oat porridge is lingonberry jam (I’m personally not a fan of that). Also, I don’t find emmental and grevé to be similar at all. No emmental cheese I’ve eaten have had the nutty flavour of grevé (and it should be mature one too). Oh, and from the part I’m from, flatbread and goats cheese and.. goat-something… (uhm.. not sure how to translate it, but if you google “getmese” or “messmör” you might get what I mean) are common too. Thanks for the comment, Ezra! Moose meat sounds exotic. It’s interesting that salmon is too expensive in Sweden, while moose meat is not 🙂 Oh and sorry in advance if I’ll sound stereotypical, but it’s really strange to hear that something, moreover such a staple in Scandinavia as salmon, can be too expensive for you. You guys live quite well in Scandinavia, don’t you? 🙂 Many people from my country (Lithuania) go to Norway or Sweden for work and return from there with their pockets full, ha! What I wanted to say here is that even I am able to eat salmon every single day (not in big amounts of course, just a little bit on sandwiches) while salaries in my country are almost the lowest ones in Europe. Yeah, I read about the lingonberry jam but wasn’t able to find it in my town 🙂 Rice porridge is awesome, we love it here too. Thanks once more for clarifying some things and providing more interesting information! Well, the moose meat is cheap in the area I come from because pretty much everyone has at least one hunter in the family. It’s true Sweden is a rich country, but that also means everything is more expensive. 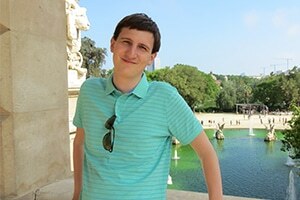 I live in UK now, for studies, and I’ve been to Romania for my university, most things, including food, is about half the price than back home in Sweden. I believe that’s one of the reasons people from other countries that’s working in Sweden have so much money when they return, our salaries are made for our prices, while the prices in other countries are lower. Also, poverty do exist in Sweden (it’s a rather common misconception that everyone is well off there and that the government will make sure you are, all of it sounds good on paper, but doesn’t always work irl), I’m from one of those families where money has always been a struggle, but even for the more average citizen, it would be too expensive to eat salmon daily, though eating salmon once or twice a week (if you buy it raw and frozen) is within most families’ budget. Sweden is not perfect, but it’s a good place and I do miss certain foods (like “fiskbullar” -fish balls-, “smörgåsgurka” -sweet and sour pickled cucumber- and salty liquorice) but most of all, I miss the nature and the solitude. My mother was born in Sundsvall, Sweden. When I was growing up, once a month we would drive downtown to the Swedish Arpi for herring breakfast. It included pan-fried fresh herring, boiled potatoes, and a horseradish cream sauce. I’m pretty sure there was something else on the plate, but I don’t remember what. Pancakes were for Thursday night – Platte and pea soup. I just discovered your site. 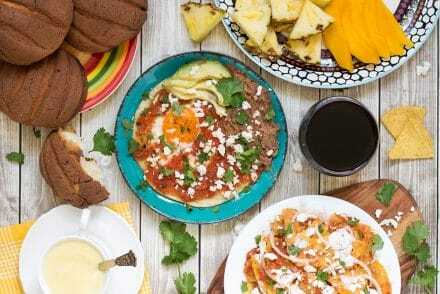 I can’t wait to try all the different breakfasts from around the world. Thanks for putting this together. I am glad you liked the blog, Molly. Enjoy!